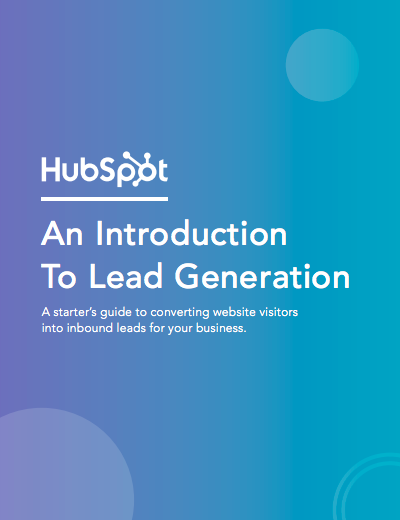 HubSpot also recommends this introductory lead generation resource. We've all been through it. You know, the moment you're about to dig into the best darn pile of spaghetti and meatballs you've ever seen. Just as you twist your fork in the pasta, spear a mouth-watering meatball, and go in for the first savory bite ... the phone rings. "May I speak to Lindsay Kow-low-witch?" asks the telemarketer on the other end. "This is an important message regarding your oven preferences." This frustrating interruption is exactly why we're here to discuss inbound lead generation. What is inbound lead generation? It's a solution that can save your business or organization from being that annoying, disruptive cold caller who is ruining spaghetti nights for pasta lovers all over the world. Let's start with defining a lead, and then we'll cover what online lead generation is, why you need lead generation, how you qualify someone as a lead, how you generate leads, and why inbound lead generation is much more effective than simply buying leads. A lead is a person who has indicated interest in your company's product or service in some way, shape, or form. As a lead, you'd hear from a business or organization with which you've already opened communication … instead of getting a random cold call from someone who purchased your contact information. And from a business perspective, the information the auto company collected about you from your survey responses helps them personalize that opening communication to address your existing problems. Lead generation is the process of attracting and converting strangers and prospects into someone who has indicated interest in your company's product or service. Some examples of lead generators are job applications, blog posts, coupons, live events, and online content. Whenever someone outside the marketing world asks me what I do, I can't simply say, "I create content for lead generation." It'd be totally lost on them, and I'd get some really confused looks. So instead, I say, "I work on finding unique ways to attract people to my business. I want to provide them with enough goodies to get them naturally interested in my company so they eventually warm up to the brand enough to want to hear from us!" That usually resonates better, and that's exactly what lead generation is: It's a way of warming up potential customers to your business and getting them on the path to eventually buying. When a stranger initiates a relationship with you by showing an organic interest in your business, the transition from stranger to customer is much more natural. Now that we understand how lead generation fits into the whole inbound marketing methodology, let's walk through the steps of the lead generation process. First, a visitor discovers your business through one of your marketing channels, such as your website, blog, or social media page. That visitor then clicks on your call-to-action (CTA) — an image, button, or message that encourages website visitors to take some sort of action. The CTA takes your visitor to a landing page, which is a web page that is designed to capture lead information in exchange for an offer. An offer is the content or something of value that's being "offered" on the landing page, like an ebook, a course, or a template. The offer must have enough perceived value to a visitor to merit providing their personal information in exchange for access to it. See how everything fits together? To sum it up: Visitor clicks a CTA that takes them to a landing page where they fill out a form to get an offer, at which point they become a lead. By the way, you should check out our free lead generation tool. It helps you create lead capture forms directly on your website. Plus, it's really easy to set up. Once you put all of these elements together, you can use your various promotional channels to drive traffic to your landing page to start generating leads. But what channels should you use to promote your landing page? Let’s talk about the front-end of lead generation — lead gen marketing. If you’re a visual learner, this chart shows the flow from promotional marketing channels to a generated lead. There are even more channels you can use to get visitors to become leads. Let’s go into depth on these and talk about a few others. Email is a great place to reach the people who already know your brand and product or service. It’s much easier to ask them to take an action since they’ve previously subscribed to your list. Emails tend to be a bit cluttered, so use CTAs that have compelling copy and an eye-catching design to grab your subscriber’s attention. The sole purpose of an ad is to get people to take an action. Otherwise, why spend the money? If you want people to convert, be sure that your landing page and offer match exactly what is promised in the ad, and that the action you want users to take is crystal clear. The great thing about using your blog posts to promote an offer is that you can tailor the entire piece to the end goal. So, if your offer is an instructional video on setting up Google Search Console, then you can write a blog post about how to select your marketing metrics … which would make your CTA highly relevant and easy to click. Social media platforms make it easy to guide your followers to take action, from the swipe up option on Instagram stories to Facebook bio links to bitly URLs on Twitter. You can also promote your offerings on your social posts and include a call-to-action in your caption. Learn more about social media campaigns in this post. You can break down a lot of barriers to a sale by offering trials of your product or service. Once a prospect is using your product, you can entice them with additional offers or resources to encourage them to buy. Another good practice is to include your branding in your free versions so you can capture other potential customers, too. Referral, or word-of-mouth, marketing is useful for lead generation in a different way. That is, it gets your brand in front of more people, which, in turn, increases your chances of generating more leads. Whatever channel you use to generate leads, you’ll want to guide users to your landing page. As long as you’ve built a landing page that converts, the rest will handle itself. Why Not Just Buy Leads? Marketers and salespeople alike want to fill their sales funnel — and they want to fill it quickly. Enter: The temptation to buy leads. Buying leads, as opposed to organically generating them, is much easier and takes far less time and effort, despite being more expensive. But, you might be paying for advertising anyway … so, why not just buy leads? First and foremost, any leads you've purchased don't actually know you. Typically, they've "opted in" at some other site when signing up for something, and didn't actually opt in to receiving anything from your company. If the prospect has never been to your website and indicated an interest in your, products or services, then you’re interrupting them ... plain and simple. If they never opted in to receive messages specifically from you, then there's a high chance they could flag your messages as spam, which is quite dangerous for you. Not only does this train to filter out emails from you, but it also indicates to their email provider which emails to filter out. Once enough people flag your messages as spam, you go on a "blacklist," which is then shared with other email providers. Once you get on the blacklist, it’s really, really hard to get back off of it. In addition, your email deliverability and IP reputation will likely be harmed. It's always, always, always better to generate leads organically rather than buy them. Read this blog post to learn how to grow an opt-in email list instead of buying one. As we covered in the first section, a lead is a person who has indicated interest in your company's product or service. Now, let's talk about the ways in which someone can actually show that interest. Job Application: An individual that fills out an application form is willing to share a lot of personal information because he/she wants to be considered for a position. Filling out that application shows their true interest in the job, therefore qualifying the person as a lead for the company's recruiting team — not marketing or sales teams. These three general examples highlight how lead generation differs from company to company, and from person to person. You'll need to collect enough information to gauge whether someone has a true, valid interest in your product or service — how much information is enough information will vary depending on your business. Let's look at Episerver, for example. They use web content reports for lead generation, collecting six pieces of information from prospective leads. Full Name: The most fundamental information needed to personalize your communication with each lead. Email: This serves as a unique identifier and is how you will contact your lead. Company: This will give you the ability to research your lead’s industry and company and how the lead might benefit from your product or service (mainly for B2B). Role: Understanding an individual's role will help you understand how to communicate with them. Every brand stakeholder will have a different take and perspective on your offering (mainly for B2B). Country: Location information can help you segment your contact by region and time zone, and help you qualify the lead depending on your service. State: The more detailed information you can obtain without sacrificing conversions, the better. Knowing your leads state can help you further qualify them. If you'd like to learn more intermediate-level tips on information collection and what you should ask for on your lead gen forms, read our post about it here. A lead’s score can be based on actions they’ve taken, information they’ve provided, their level of engagement with your brand, or other criteria that your sales team determines. For instance, you may score someone higher if they regularly engage with you on social media or if their demographic information matches your target audience. Borrowing from the examples above, you might give a lead a higher score if they used one of your coupons — an action that would signify this person is interested in your product. The higher a lead’s score, the closer they are to becoming a sales-qualified lead (SQL), which is only a step away from becoming a customer. The score and criteria is something you may need to tweak along the way until you find the formula that works, but once you do, you’ll transform your lead generation into customer generation. So ... you're getting web traffic and generating leads. But how are you doing compared to other companies in your industry? 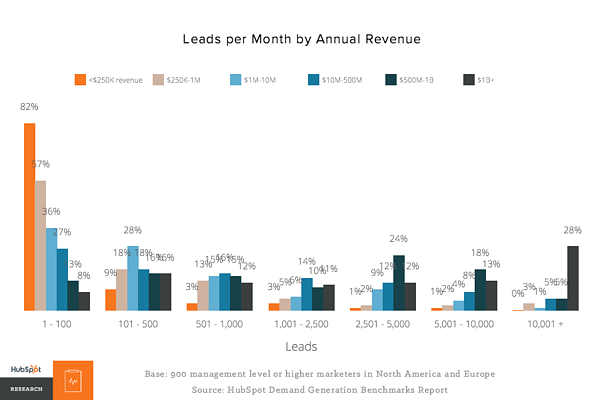 How many leads should you really be generating? 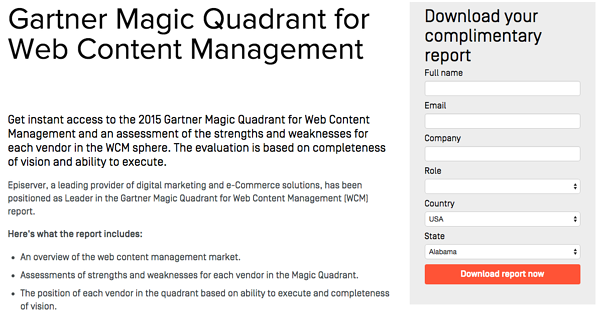 For in-depth reports, download our Demand Generation Benchmarks Report. Below are some useful highlights. 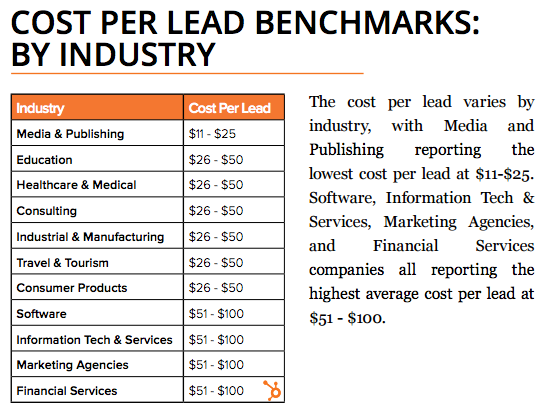 The media and publishing industries report the lowest cost per lead at $11 to $25. Software, information technology and services, marketing agencies, and financial services companies all report the highest average cost per lead at $51 to $100. 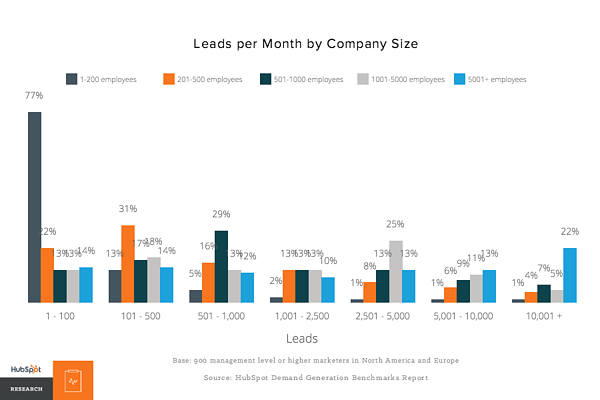 We found that 58% of companies generated 500 leads per month or fewer, and 71% generated 1,000 or fewer. However, as we saw previously, the companies having the most success are also the ones generating the most leads. Online lead generation encompasses a wide range of tactics, campaigns, and strategies depending on the platform on which you wish to capture leads. We talked about lead capture best practices once you have a visitor on your site … but how can you get them there in the first place? Let’s dive into lead generation strategies for a few popular platforms. Get some lead generation tips for Facebook. Learn some lead generation tips for Twitter..
LinkedIn has been increasing its stake in the advertising space since its early days. When it comes to lead generation, LinkedIn created Lead Gen Forms, which auto populate with a users profile data when they click a CTA, making it easy to capture information. Get tips from our experience using LinkedIn ads. When we say pay-per-click (PPC), we’re referring to ads on search engine result pages (SERPs). Google gets 3.5 billion searches a day, making it prime real estate for any ad campaign, especially lead gen. The effectiveness of your PPC campaign relies heavily on a seamless user flow, as well as your budget, target keywords, and a few other factors. Learn more about how to setup successful PPC ads. B2B is a particular business model that requires a particular approach to lead generation. HubSpot found that SEO is the top resource for capturing business leads, followed closely by email marketing and social media. Not to mention, effectiveness varies by channel. Learn the B2B lead gen techniques for every channel. In any given lead generation campaign, there can be a lot of moving parts. It can be difficult to tell which parts of your campaign are working and which need some fine-tuning. What exactly goes into a best-in-class lead generation engine? Here are a few tips when building lead gen campaigns. Use the right lead generation tools. 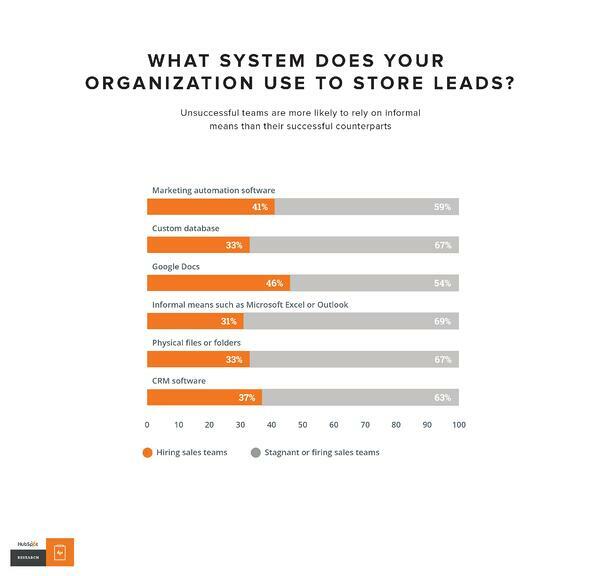 As you saw in our data, the most successful marketing teams use a formal system to organize and store their leads. That's where lead generation tools and lead generation software come into play. How much do you know about the people visiting your website? Do you know their names or their email addresses? How about which pages they visited, how they're navigating around, and what they do before and after filling out a lead conversion form? If you don't know the answers to these questions, chances are you're having a hard time connecting with the people who are visiting your site. These are questions you should be able to answer — and you can with the right lead generation tools. CTA Templates: 50+ free, customizable call-to-action (CTA) templates in PowerPoint that you can use to create clickable CTA buttons to use on your blog, landing pages, and elsewhere on your site. Example of a slide-in lead flow. Create amazing offers for all different stages of the buying cycle. Make sure you're creating offers for each phase and offering CTAs for these offers throughout your site. Yes, it takes time to create valuable content that teaches and nurtures your leads down the funnel, but if you don't offer anything for visitors who aren't ready to buy, then they may never come back to your website. From checklists to templates to free tools, here are 23 ideas for lead generation content to get you started. If you want to take personalization a step further — which will help boost your conversion rate — try using smart CTAs. Smart CTAs detect where a person is in the buyer’s journey, whether they're a new visitor, a lead, or a customer, and display CTAs accordingly. Personalized CTAs convert a whopping 42% more visitors than basic calls-to-action. Keep your messaging consistent and deliver on your promise. The highest-converting lead gen campaigns are the ones that deliver on what they promise and create a seamless transition from ad copy and design to the deliverable itself. Make sure that you’re presenting a consistent message throughout the process and providing value to everyone that engages with your lead capture. Link your CTA to a dedicated landing page. This may seem obvious to you, but you'd be surprised how many marketers don't create dedicated landing pages for their offers. CTAs are meant to send visitors to a landing page where they can receive a specific offer. If you want to learn more about how to build and promote high-converting landing pages, then download our ebook on optimizing landing pages for conversions. Get your sales team involved. Also, be open to evolving your relationship with sales and how you guide leads along your funnel. Your definitions will likely need to be refined over time; just make sure to keep everyone involved up-to-date. While marketers typically think of social media as best for top-of-the-funnel marketing, it can still be a helpful and low-cost source for lead generation as shared in the lead gen strategies above. The key is using social media strategically for lead generation. You can also do a lead generation analysis of your blog to figure out which posts generate the most leads, and then make a point of regularly linking social media posts to them. Remain flexible and constantly iterate. There you have it, folks. Now that you know more about how to generate leads for your business, we recommend you try HubSpot's free lead generation tool. Use it to add simple conversion assets to your site (or scrape your existing forms) to help you learn more about your site visitors and what content prompts them to convert.